A Wi-Fi connection is typically the preferred method for most people with Wi-Fi devices, but it's not always the best one. Since Wi-Fi signals lose strength the farther you are from the router, some home designs and building materials can pose a real problem when it comes to staying connected. If you're seeking a way to support and maintain an otherwise unreliable signal, powerline connection just might be your answer. The electrical wiring in your home comes standard—but it can do a lot more for you than just keep the lights on. An alternative to running Ethernet cables through the walls, powerline adapters take advantage of the existing electrical wiring in your home to transfer network signals between rooms that otherwise would be out of range—all you need is a power outlet. Powerline doesn’t impact your electricity when the network is in use, despite being able to support a variety of frequencies without interference. Powerline connections also have less data loss and better speeds than regular Wi-Fi, regardless of how far your computer is from the router or how many obstructions there are between the two. To set up a powerline connection, you’ll need a router, Ethernet cables, and at least two powerline adapters—one for the router and one for each device you want to connect. Plug the first adapter into the power outlet nearest your router and connect it to your router using an Ethernet cable. Then, in another room, use another Ethernet cable to connect the other powerline adapter to your media player, computer, or other Wi-Fi device. Once you plug the second adapter into a power outlet, the two adapters will use the electrical wiring running between the rooms to send each other network signals, creating an Internet connection where the router otherwise wouldn’t be able to reach. Powerline is useful to anyone who needs to extend their network coverage. It's also a great way to achieve the fastest connection possible—to gaming consoles or streaming media players, for example—and connects old devices that don't feature built-in Wi-Fi connectivity. It's especially effective in larger spaces or old buildings with thick walls, concrete, metal or other obstructions—all of which interfere with Wi-Fi signals. For example, Europeans rely on powerline because their buildings can be more than two hundred years old and made of obstructive materials. Powerline is not, however, a good solution for a home that's been wired improperly or that's short on available power sockets. The main advantage of powerline is its convenience, as it eliminates the need to run cables and relies on the existing wiring for a plug-and-play network that's up and running in a matter of minutes. Another advantage is its reach—it extends your network to the farthest outlets of your home, where a typical router may be unable to broadcast its signal. Additionally, it is a more secure connection because it sends signals using the copper wiring of your home, which can't be hacked. Powerline isn't only for homes with poor Wi-Fi coverage. 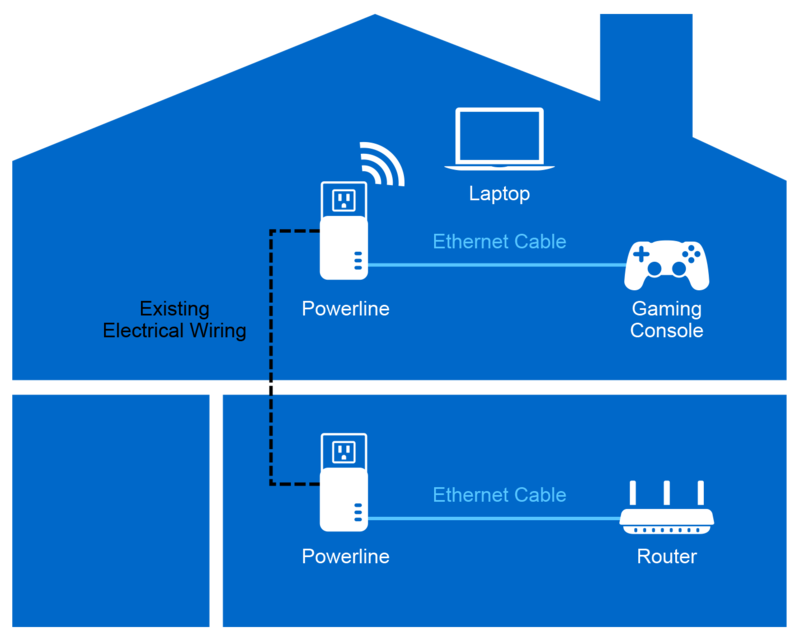 Because it bridges the connection between your router and Wi-Fi devices, a powerline system can be incorporated into a network even when there's a Wi-Fi hub already in place. Powerline supports more consistent speeds, extends the data to the far reaches of your home, and can be used with a range extender to get an even better signal on an otherwise operational network. Some adapter models also sport multiple Ethernet ports, which makes them a great solution for connecting multiple cabled devices in the same room. Look for an adapter with the highest data transfer rates you can afford, especially if you plan to use it for streaming or game play. The higher the Megabits per second (Mbps), the better speed you'll enjoy. Ideal models support 500 to 600 Mbps. Most powerline adapters won't work when they're plugged into an extension cord or surge protector. Plug the adapter directly into the wall socket for best performance. A basic powerline adapter may be boxy and large, blocking both outlets where it's plugged in. Look for a model with an electrical pass-through outlet so you can still use the outlet for other electrical devices. If your home's power outlets are located close to the floor, purchase an adapter that positions the Ethernet ports on the top to allow easier access for the cable. Disconnect mobile device chargers when downloading or streaming heavy data over the network as they might cause interference over your power lines.